When the pavement stops, you don't. This tyre loves to get a hold on rough, rutted trails. And it does with its advanced tread pattern grip that cuts through mud, sand, dirt and snow. Excellent wear resistance and enhanced on-road driving performance complement optimum off-road traction. Robust off-road capability and smooth on-road comfort. All-terrain versatility. 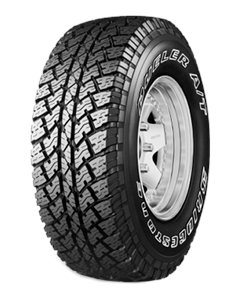 Sorry, we currently do not have any tyres with the Dueler A/T 693 pattern in stock.